Who would’ve thought a rosin flux could be water-soluble? 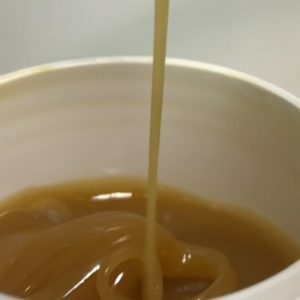 But that’s exactly what we’ve formulated in our 8800-TF Water-Soluble Rosin Tacky Flux – a rosin flux with all the benefits of rosin, all the while being super-easy to clean post solder with nothing more than water. Up until now, you had to settle. If you wanted the benefits of rosin in a tacky flux, you needed to accept post solder cleaning that involved harsh solvents. And if you wanted the benefits of a water-soluble tacky flux, then you had to give up the time-tested benefits of a rosin flux (that right combination of stability, activity and precision). But now, with our 8800-TF Water-Soluble Rosin Tacky Flux, there’s no reason to settle. You can have it all: the benefits of Rosin before and during soldering, and water washability after soldering. Our 8800-TF Tacky Flux has the control and precision application features of a rosin tacky flux. You can apply the flux with a syringe or automatic dispensing system precisely where you want it and in the exact quantity you need. No splatter, no slump. Our 8800-TF Tacky Flux can also be printed onto a board using manual or automatic stencil printing systems. The 8800-TF prints with precision, even on fine pitch pads, and maintains its form without slumping. Post-solder washing is easy. Use either hot de-ionized water or, if you prefer, isopropyl alcohol (electronics grade). No need to use harsh solvents for post solder cleaning. In terms of activity, No. 8800-TF is mild enough to be classified as an ROL0, but strong enough to get the job done. It can even solder hard-to-solder Nickel alloys, such as Alloy 42. In our lab we’ve even soldered to mild steel using this tacky flux! In tests conducted with ENIG boards, as the gold moves into the tin, the 8800-TF actually chelates with the nickel underneath to create a strong solder-filled bond. The 8800-TF is a versatile tacky flux. It features a stable viscosity, long tacky time and long stencil life. It can reflow from 137-227⁰C (280-440⁰F). The 8800-TF has excellent wetting abilities. It also does not exhibit crystal growth over time. In addition to offering our water-soluble rosin technology in this tacky flux, we also offer it in solvent-based liquid form, our Superior WS-ROL0-LF1, as well as in a solder paste form. Contact Us for information about the 8800-series water soluble, rosin-based solder pastes. Learn more about our growing line of Tacky Fluxes.